This room selector software was designed for students to quickly find, view and book their student halls without having to leave their computer. The system allows users to view an accurate room plan including dimensions, how the furnishings are located as well as images within the room. A student can see everything they need to make a decision about their preferred accommodation making the whole process much more manageable. The bespoke made software can be integrated into many booking systems, completely automating the booking process while being protected by a login screen. It is also completely branded to the client’s specifications. Admins can edit each room with an easy to use drag and drop interface as well as download reports of room availability and pricing. Only students with actual offers can enter the booking system which cuts down on the administration in the event that they don’t achieve their results. The app ensures there is no last-minute rush to get accommodation and makes the whole process much less stressful for all involved. 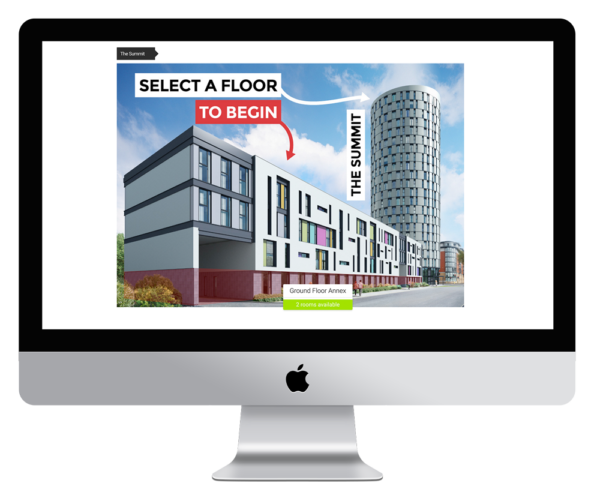 Currently, the software is operating in various student halls serving Leicester & Demontfort University with a view to expanding nationwide very soon. If you need help creating a bespoke booking web application we’ll be happy to offer our expertise. Contact us to discuss your idea. We’re happy to provide an NDA for your peace of mind.